When you look in the mirror are you greeted with a brilliantly white, picture-perfect smile? In most cases, the answer is no. Food and drinks consumed on a daily bases, years of wear and tear, and common medications all contribute to tooth staining, yellowing, or discoloring over time. If you’re unhappy with the off-white hew of your smile, the Richmond dentist and team at VL Dental have the solution: KöR Whitening and Deep Bleaching. If you’re unhappy with your smile, teeth whitening is a cosmetic dentistry service that dramatically enhances smiles painlessly with minimal time investment. Teeth whitening is a popular cosmetic dentistry option, and a trip to any local pharmacy or grocery store makes this apparent. There are shelves of whitening gels, strips, toothpastes, and mouth rinses. Unfortunately, these products are not typically able to offer the dramatic results they promise. Professional whitening in a dental practice or using custom-made application trays and professional-grade whitening gels, have better, more predictable results for patients. However, for some discoloration that has absorbed into the dentin layer of teeth below the enamel, even professional teeth whitening may not be enough. Luckily, VL Dental offers the KöR Whitening and Deep Bleaching systems proven effective in removing the most difficult staining caused by fluorosis and tetracycline medications. KöR Whitening is an at-home teeth whitening system that utilizes customized application trays, and professional-grade whitening gel. Unlike other whitening treatments, KöR starts with a desensitizing treatment in our office that prepares teeth to absorb whitening gel, but protects the inner pulp layer of teeth that contains the nerve. Throughout treatment, patients use desensitizing agents at home. Because KöR whitening has a fully refrigerated transportation and storage process, the gel remains active for 6 or more hours. Patients wear their application trays overnight for two weeks, and see dramatically whiter smiles even if their teeth were previously unresponsive to whitening. KöR Deep Bleaching is a combination of in-office and at-home treatment. 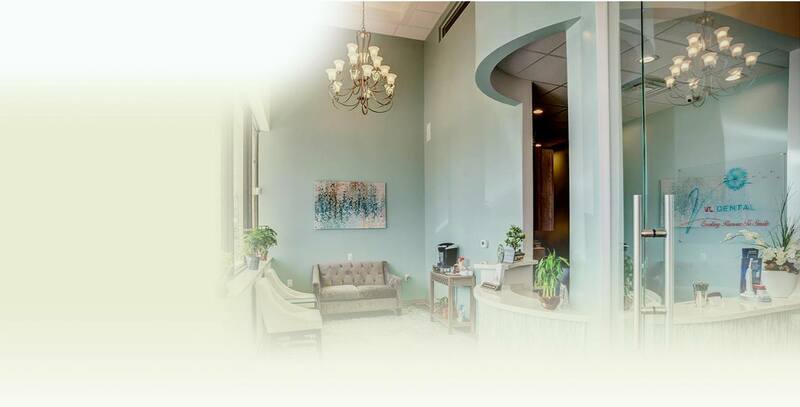 The patients begin with in-office tooth desensitizing and preparation and at-home treatment, but they return to our office for an hour-long in-office bleaching. This is a great option for patients who have stains or discoloration caused by fluorosis or tetracycline. Fully refrigerated transportation and storage – leads to more predictable results from patient to patient since the gel does not dramatically decline in quality over time. Refrigeration also allows the gel to remain active longer after application. Patients whiten teeth throughout the night for 6 or more hours compared with 30 to 45 minutes of active whitening from other products. Decreased sensitivity –freshness also contributes to decreased sensitivity since additional chemicals to make the gel shelf stable are not necessary. Additionally, the KöR system makes dental desensitization part of the process from start to finish. Blocking the tubules in teeth that transmit whitening products to the inner pulp layer causing discomfort, pain, or sensitivity following traditional whitening treatments. Increased effectiveness – predictability is just one of the many benefits added by the refrigerated transport and storage, but the unique KöR whitening gel formula, extended active whitening time, and improved application technique make it the most effective teeth whitening available. If you’re interested in KöR teeth whitening, any of our cosmetic dentistry services, or you're ready to schedule a consultation, contact VL Dental, your Richmond cosmetic dentists today.